This sensational statement rose side tiara is dramatic and full of vintage style. This vintage inspired statement silver tone rose side tiara is a piece to treasure. 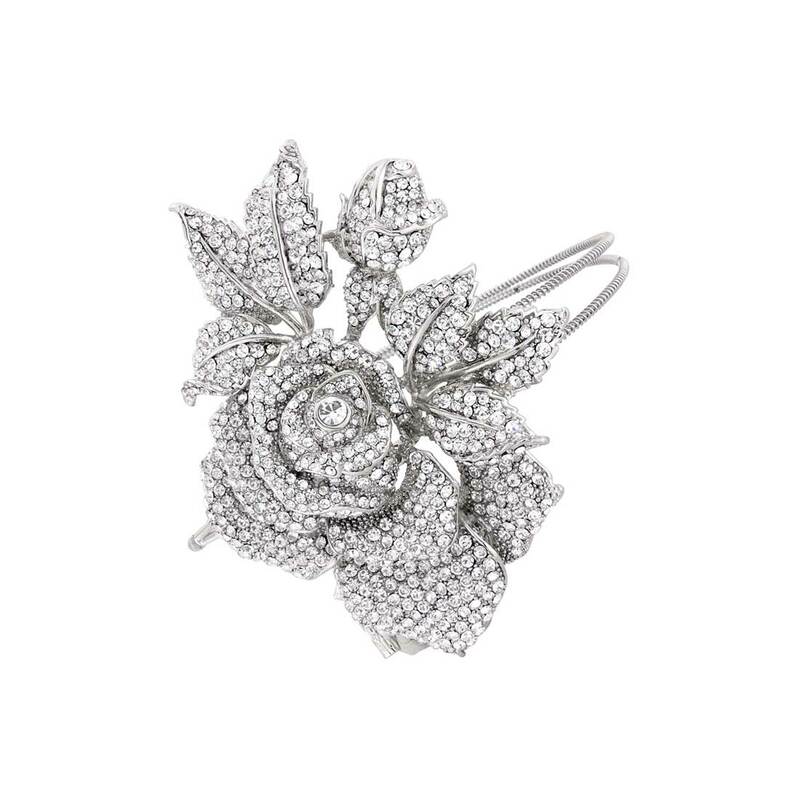 Featuring an extravagant rose with layered petals, clusters of leaves and a rose bud encrusted with sparkling Austrian crystals and set on a double silver tone band, its beauty is breathtaking. A beautiful headpiece, it literally covers the side of the head with dramatic vintage style. Adorn loose curls with romance, add statement style to a chic bob or adorn the opposite side of the head to a feminine tousled low side bun with timeless class. A show stopping side tiara for brides who adore bold wedding headpieces with the wow factor, it exquisitely enhances a vintage style gown. Coordinate with simple drop earrings to keep this rose side tiara the main focal piece. Huge beautiful rose, quite heavy but truly a stunner..Everyone complimented on it on my wedding day 5 weeks ago..Can't wait to see it in professional photos! Really beautiful. Worth every penny. Just arrived and I couldn't be happier! Its an amazing piece, stunning! Confident it will receive compliments galore on my wedding day!